Begin by contacting the Medical Records Department (or equivalent) of the hospital where your baby was born, to find out their particular process for retrieving your records. You can try explaining to the staff that your reason for wanting access to your records is to be able to make sense of your birth emotionally. This might evoke a more helpful response from staff and somewhat allay their fears of litigation. Be aware that in many hospitals, an administrative fee will apply. It is not uncommon for some private hospitals to suggest that you can avoid this fee and speed up the process, by requesting to have your notes sent to your family doctor. We would advise against this as we have found that once this occurs your records are considered the doctor’s property and remain at their office. You may only be able to discuss it briefly with the doctor rather than revisit areas you need to later on, perhaps with privacy. If this option is suggested, we suggest that you thank the hospital, but let them know that you would rather go ahead with the initial request for all your records. Most women find it is worth paying the fee, to be able to have the opportunity to move their healing process forward, and also to gain insights about their birth that could be useful if planning future births. Baby Notes if any baby concerns like a special care nursery admission. Going over your notes with a midwife who understands that birth matters, can be very powerful in moving a woman (and her partner) to a new level of healing and knowledge. It can also help with the interpretation of your hospital notes, which can be difficult to understand if you are not familiar with the environment of a maternity unit, or the terminology, abbreviations and shorthand used in note-taking. Going through your notes with a midwife who ’gets it‘ can lead to meaningful education to further your understanding of your birth and to empower you for possible future births (whether your own births or to support someone you care about who is birthing). You might gain insights about the reasons things occurred: why things might have been happening a particular way in your body, or what was happening around you, that may have been occuring for institutional reasons. You may also discover options for future birthing: perhaps options you may have had, but not been made aware of, and therefore could consider if similar things occur in a following birth. Rewriting your story with this new information from the birth notes can be another cathartic tool, enabling a woman to really grasp exactly what happened, and feel very certain about aspects of the birth that may have been question marks for her earlier. Some women find that this process enables them to reclaim the birth experience as their own, which can be an important step towards healing. This can be highly valuable information for planning and preparing for another birth, supporting you as you decision-make your way towards an empowering experience. Seeing the progress of a traumatic experience in black and white can be a difficult thing. But it may allow you to pinpoint areas that you need to process and grieve over to truly heal. One woman found just seeing her signature consenting to a caesarean to be an extremely emotive moment. She felt it signified “the end of my innocence”, and finally allowed herself to grieve for the trauma and pain that followed the birth. She said, “Every new aspect that I allowed myself to acknowledge and grieve led me closer to healing, and making peace with the experience.”. With that in mind, below we share what you can do if you do find discrepancies in your notes. Errors in birth records can range from minor details being left out, to blatant omissions of important events, or even statements that are untrue. Reasons for these discrepancies can range from lack of due care (health professional being rushed with too many clients) through to pure negligence or falsifying records. Perhaps the health professional was getting confused between patients, resulting in inaccuracies. Or a health carer may have written notes about your situation without having really investigated it, for example, not taking the time to see where you were ‘at’ emotionally, and therefore documenting with a standard line – ‘coping well’ – despite you knowing that this was not the case. The first thing we recommend is to do nothing, initially, that involves the health professional. Otherwise you may create a situation where you feel powerless and reliant on a particular response before you can move forward in your healing. It is more powerful and helpful, in the first instance, for you to be able to work on this for yourself. Try writing your story with what you know to be true, collating your information from what they have written, from your own memory, your partner or anyone else who was there. It can be difficult to refrain from doubting yourself, but we encourage you to hold on to what you know to be true. If the events in the birth that are missing from the records are more subjective and reliant on a health carer’s memory, there is a large chance that it is going to be a disappointing process to try and get the records adjusted, as most of the memory of health professionals actually comes from reading the notes. It can feel very disheartening and like you have been hit with a huge lack of acknowledgement when they can’t recall your birth among the many they see, and this has the potential to unnecessarily delay your healing process further. It may be better to focus on what you can control, and change, which is your own response to your birth, and your healing journey. However, if there are events that would have evidence available outside of your birth records – for example, blood transfusion, admission to intensive care, signing for drugs, or even physical evidence on yourself or your baby – you may be able to use this evidence to get the notes changed. Whether you proceed with this is your own decision, and may depend upon the level of incorrect information, and whether you see the correction of these oversights as being essential to your recovery, or as important for the future health record of you and/or your baby. The most important aspect of this process is retaining power over your own experience and your own emotional clarity, so perhaps ‘sitting on the decision’ for a while might give you some space to work on your healing, and get to a place where there is less intensity involved in getting answers and changes made. Either way, you are working towards reclaiming your birth for yourself, and moving on. We encourage women who feel they are ready, to consider taking this step of retrieving their birth notes. 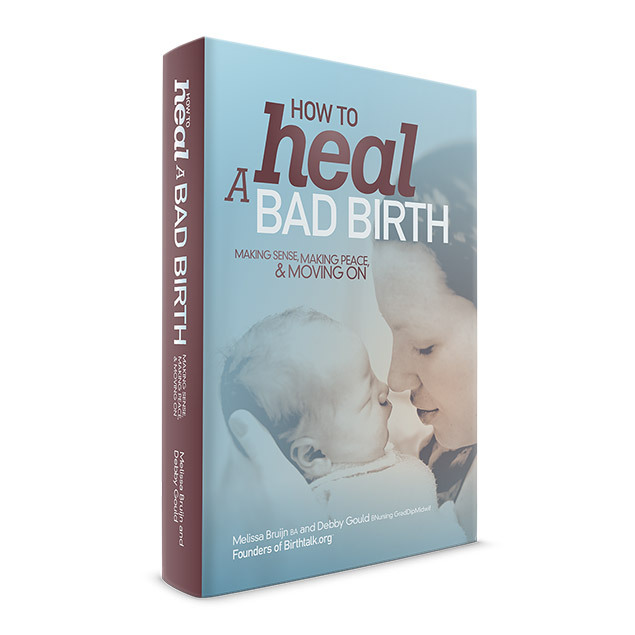 The process of exploring this can offer guidance in where you need to focus your healing, and work towards making peace and moving on from a traumatic birth. Footnote : If you are in Australia, and want to complain about accessing or correcting personal health information or medical records held by a private healthcare provider (a general practitioner, specialist or private hospital) contact the Office of the Australian Information Commissioner (www.oaic.gov.au/privacy/privacy-topics/health-for-individuals. This agency can assist with complaints about access to health information, charging for access to health information, correction of health information, and handling of personal health information.